345 people participated in the Self Realization ceremony held in Kanpur (Gujarat), India on the 27th of October 2013. 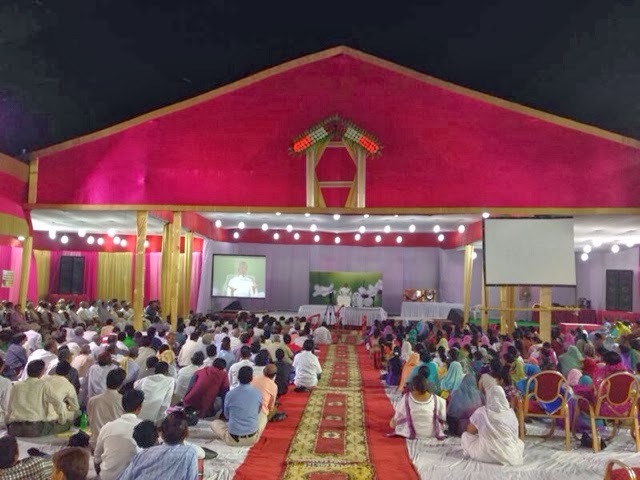 A majority of the new followers became completely engrossed in repeating the sentences spoken by Pujyashree Deepakbhai during the Self Realization ceremony. The hall resonated in synchronization with the Spiritual Master’s (Gnani’s) words right after he had spoken them. It was indeed a truly extraordinary experience, as later commented by Pujyashree himself. Questioner: Everyone I meet in life is selfish, why is it so? Pujyashree: Do you know what the meaning of worldly life (sansaar) is? In worldly life, everyone is a businessman; they are all concerned about their personal gain. There is only one person in the world, The Awakened One (Gnani) who is not a businessman. He does not want anything from you at all! Questioner: How should I adjust to different personalities? Pujyashree: It’s easy! You are already doing it by taking adjustments with Mother Nature. When you are dealing with an angry person, then think of it as summertime. If you are dealing with someone who is crying, then think of it as monsoon season. And if you are dealing with a quiet person then it is winter time. Questioner: I have always walked on the righteous path but have never found peace. Pujyashree: It is because of your insistence of righteousness and your belief that, “I am right and all these other people are wrong.” This belief creates the disturbances that are stopping you from finding peace.